To get to a database, first go to the Online Library at http://www.esc.edu/library. If you are using a Screenreader, go to the Links list. 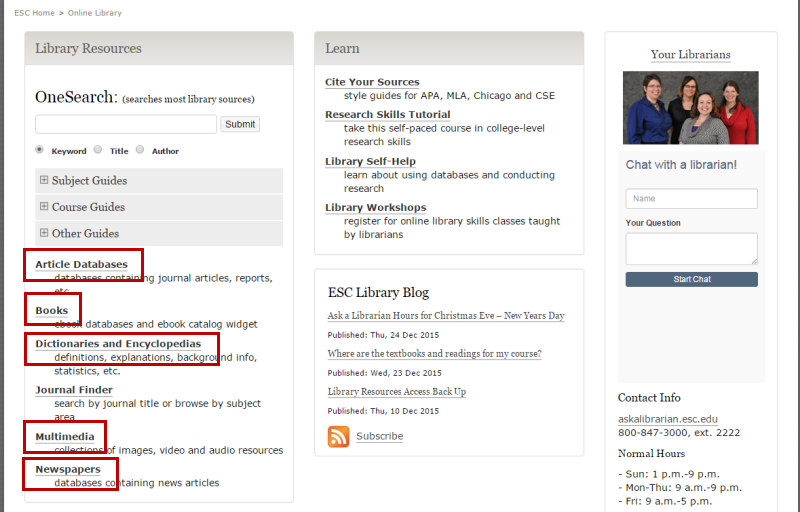 The main part of the library web site is divided into three sections: Library Resources, Learn, and ESC Library Blog. For this, you want the section called Library Resources, which is on the left and the first in terms of tab order. You can choose from Article Databases, Books, Dictionaries and Encyclopedias, Multimedia, and Newspapers. If you choose one, you will still be able to get to the others. After you click one of those links, you will find links that leave the page and go into the separate databases. If you are using a Screenreader, go to the Links list. First there is a list of links to the alphabetical sections of the page, and then a list of external links to databases. 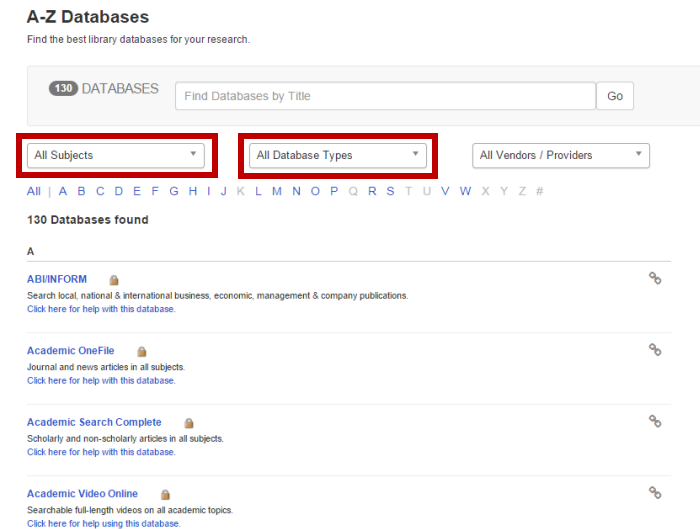 You can select any area of study and that will refresh the database list to only include databases that are good for searching in that subject area. You can select any type of database including Articles and more, Ebooks, Reference, News, Multimedia, Reports, etc. That will refresh the database list to include only databases of the type you selected. 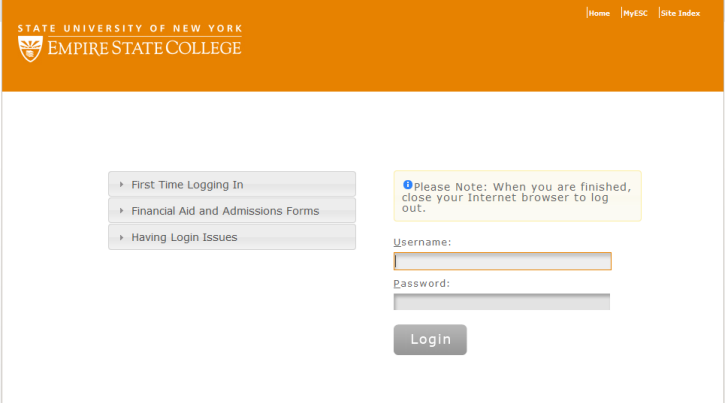 Once you click on the name of a database, you will be taken to the college's login screen. Enter the same college username and password that you use for MyESC and Moodle and click Login. Refer to the instructions for resetting your password. If you are a former student, a faculty member or a staff member and you have applied to take courses at Empire State College, you may be listed in our pre-student address book, which will prevent you from accessing library resources, even though you should have access to all library resources with faculty or staff member status, or the alumni library with alumni status. Information and Technology Services can assist you in gaining access. Try clearing your web browser's cache and resetting your cookies. Ask a Librarian for help. - Sun: 1 p.m. - 9 p.m.
- Mon-Thu: 9 a.m. - 9 p.m.
- Fri: 9 a.m. - 5 p.m.
- Sun: 1 p.m. - 5 p.m.
- Mon-Thu: 9 a.m. - 7 p.m.
- Mon-Thu: 9 a.m.-7 p.m.